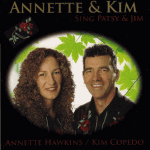 Annette Hawkins and Kim Copedo are outstanding country singers in their own right. They have both released solo CDs, Annette Hawkins “Which Way Leads Home” 2004 and “I’m Still Here” 2009 and Kim Copedo “Did You See Her” 2004. In 2000 they decided to combine their exceptional singing talents and form the duo Annette and Kim. Since then they have gone on to win many awards on the NZCMA Awards circuit. They have appeared at numerous festivals, concerts and showcases around New Zealand with some of New Zealand’s top country performers. They also work regularly with their own band “The Mountain Mist Band” comprising of; Richard Pinny on drums, Ian Anderson lead guitar, Tiny Heathcote bass and Andrew Paterson pedal steel. Annette and Kim’s voices are a magical blend of incomparable harmonies and intuitive synchronicity culminating in a delivery that is personal and heartfelt. In 2008, due to popular demand, they released their debut duo album “Something Between Us” to critical acclaim. In December 2008 the song “Wake Up And Smell The Whiskey” from the album reached number 1 on the “European Country Music Association Radio Charts Top 100” a feat never achieved before by a totally New Zealand act. In November 2009 “Chattahoochee” from the same album had reached number 13 on the chart. 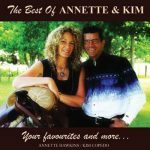 Annette and Kim were also nominated for Best Duo 2009 and Best Vocal Collaboration 2009 at the European Country Music Association Awards and were placed 4th and 5th respectively. Their duo CD “Something Between Us” was nominated as a top three finalist “Best Country Album 2009” at the New Zealand Tui Awards. Also between 2009 and 2013 inclusive they have been nominated as a top three finalist “Country Music Best Duo/Group of the Year” at the Kiwi Pro-am National Country Music Awards and have also been nominated in the “Country Music Female Artist of the Year” and “Country Music Male Artist of the Year” category’s as solo artists. In 2007 and 2008 as a duo they were finalists in the NZCMA Entertainer of the Year Awards and in 2005 were finalists in the NZCMA Songwriters Awards with the song “Shadow of My Heart” which they co-wrote. In 2003, 2008 and 2010 Kim was runner-up in the NZCMA Songwriter of the Year Award and in 2011 and 2013 was the winner of the NZCMA Songwriter of the Year Award with the songs “Sometimes I Don’t Remember Being Young At All” and “Not The Leavin’ Kind” respectively. 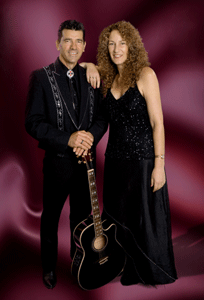 They have both represented New Zealand at the Norfolk Island Trans-Tasman Entertainer of the Year Award held annually during the Norfolk Island Country Music Festival with Annette winning the coveted title in 2008. Since 2008 Annette and Kim have been hosting tours to the Norfolk Island Country Music Festival. Don’t miss out on the opportunity to accompany Annette and Kim to Norfolk Island in May 2014. In 2011 and 2012 they were invited to perform at the Barham Country Stampede held in Barham NSW Australia and have proven to be so popular that they were invited back in February 2014. They have been regular performs for many years at the world renowned Bay of Islands Country Rock Festival held annually in Paihia New Zealand and are becoming regular performers at the popular Marton Country Music Festival. They will again be performing at the May 2014 Bay of Islands Country Rock Festival with “The Mountain Mist Band” and have confirmed their appearance at the January 2015 Marton Country Music Festival. Be sure to catch them at one of these great country music festivals. Since 2010 Annette and Kim have been kept busy with singing engagements locally, nationally and internationally. 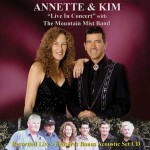 In May 2012 Annette and Kim released their second album together “Annette & Kim Sing Patsy & Jim”. This is a tribute album of solo performances covering the songs of Patsy Cline and Jim Reeves which Annette and Kim grew up listening to. Their dedication to traditional country music lead to them being inducted into “America’s Traditional Country Music Hall of Fame” in 2013 at the annual Traditional Country Music and Bluegrass Festival held in Le Mars, Iowa, USA, which they attended to accept their induction certificates, after having been nominated by their good friend, Anne George. Their duo album “Something Between Us” also being awarded “Classic Country Album of the Year 2013” by the Rural Roots Country Music Commission. 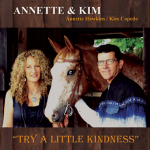 After many requests and with the support of friends and family Annette and Kim released their 2nd duo album “Try a Little Kindness” in February 2014. It is another blend of traditional and modern country music that has proven to be so popular with their fans. The album is available now so don’t miss out on your copy. Albums can be purchased through the web site or by contacting Annette or Kim directly. Their main aim has always been to have fun, enjoy their music and to entertain their audiences which has made them one of New Zealand country music’s most popular duos.